The Worlds have seen their endless threats from the Heartless, the Nobodies, and the constantly resurfacing Organization XIII. Now we've got folks getting 'Norted as the big bad who just can't leave well enough alone has this idea that he deserves a bunch of extra lives. What does he think this is? Super Mario!? Well, good thing that the whole team is on to Xehanort's plans and are ready to close those doors to darkness for good! That said: they're going to need all seven of the guardians of light and somehow they're not even sure who they're all supposed to be. Umm. Have they even been paying attention? Did they just overlook Kairi? Princess of Heart plus a newfound Keyblade Wielder? Is there even a better choice for some dark-repellant force of amazing? Well, whatever folks at Square-Enix think, we know that Kairi is the one who has our hearts and we're pretty sure she's got yours, too. 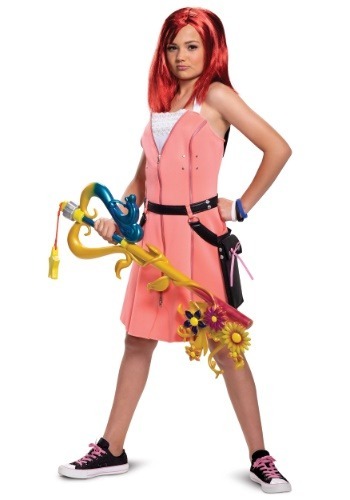 That's why we are happy to chant the mantra and bestow the Keyblade to you and yours with this Kingdom Hearts Kairi Deluxe Costume for teens. This amazing look includes the pleated, sleeveless pastel dress that Kairi began wearing in Kingdom Hearts II when she first revealed she would join the ranks of the Keyblade Wielders! Make sure that the costume is all the more complete with her flower-themed Keyblade and show the naysayers that it's going to be Kairi that saves the day in KH3! Sure, those Disney Princesses of Heart are some pretty amazing gals, ready to help Sora and the gang save every world out there. But, nobody can even compare to one who also stands up with a Keyblade in hand to confront the darkness directly. It's time for Kairi's defining moments! May your heart be your guiding key!